November is the perfect month between fall and winter - the ideal scenario to get away with anything and get your winning mood on! Deposit as little as $25 and once per day you’ll have special access to a 225% Match and 50 Cash Bandits Spins! 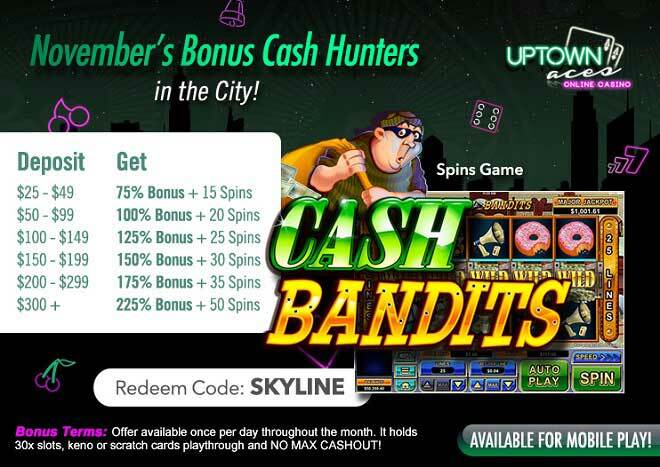 The bright Uptown city lights shine even brighter this November when join the Cash Bandits in search for wins. Take this fun game out for a spin, bring your sweater and scarf and cozy up to the 5 reels and 25 paylines of Cash Bandits! The seasons are changing to winning ones Uptown with help of the sneakiest bandits when you deposit as little as $25 once per day throughout the month of November.